Alone-Together.org is a space in which young adults reach out to others, through the sharing of honest and open reflections on their personal struggles, methods of resiliency, and messages of hope for those currently struggling. Begin reading OPEN LETTERS of struggle and resiliency, now. Some open letters on this site deal with difficult topics and therefore some content may be emotionally challenging for certain readers. This site is not appropriate for younger (below high-school-age) visitors. Should any of the content bring up difficult emotional issues for you, please visit our RESOURCES page to find the best form of help. Remember, you are not alone. visitors to this site will realize that they are not alone in their struggles. these stories will, in turn, inspire hope and confidence in anyone struggling, that they can make it through tough times. individuals will be encouraged to reach out to others for help, and on behalf of others who cannot reach out for themselves. adults may gain valuable insight into the lives of teens and young adults. this project will spur productive dialog about mental health issues. Each contributor of a personal "open letter" also submits a photograph of their hands. This is a way to personalize their stories in a visual way, while retaining anonymity. 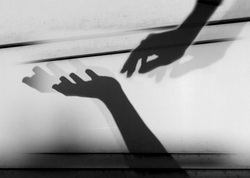 The motif of hands also symbolizes the act of reaching out to others. This project was created by a Northern Virginia high school teacher as a response to the seemingly increasing stress and anxiety faced by her teenage students and their families, in addition to multiple tragedies within the community. The first group of open letters were all former art students, and therefore many reflections mention the importance of their high school art classes. Alone-Together.org now hopes to branch out to include many other types of voices as well. If you are interested in contributing your own, personal, "open letter" to our site, please visit our submissions page in order to get started.